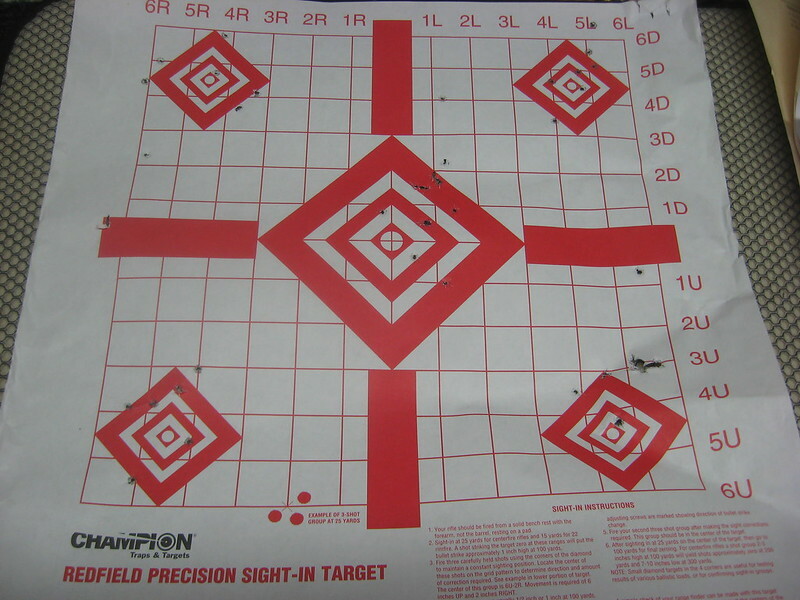 - 20 fast press-out and fire (DA) with target transitions, targets were two 2X2 sticky notes, one placed at about 7 o'clock, and one and at 1 o'clock, so I could work on transitioning to that lower-left-quadrant target in the around the clock drill that gives me problems. 3.25 second PAR. Moved to a different room in my basement that is a little longer and used smaller sticky notes than previously to try and mimic longer distances at the range. Dumb question: when shooting weak-hand only, do you switch eyes for aiming? I am right eye dominant, and when shooting freestyle or with strong-hand only, I close my left eye. When switching to weak (left) hand only, should I be closing right eye and aiming with left eye? Baldrage--regarding the weak side eye question. I don't think it is necessary to try to use your non-dominant eye for the weak side shooting. Your brain is used to the dominant eye, so use the dominant eye when shooting weak hand. I agree - I do when qualifying every years, works OK. It doesn't hurt to fire a few rounds with the dominant eye closed, to simulate eye injury, but not every time shooting weak hand. Thanks for the feedback. Glad to know I was not doing it wrong. On the other hand, given the way I have been shooting on dot torture drills, maybe I should switch which eye I use! Intent for today's session was to benchmark and see where I am after a month of training. Started off w/Dot Torture at 5 yards. 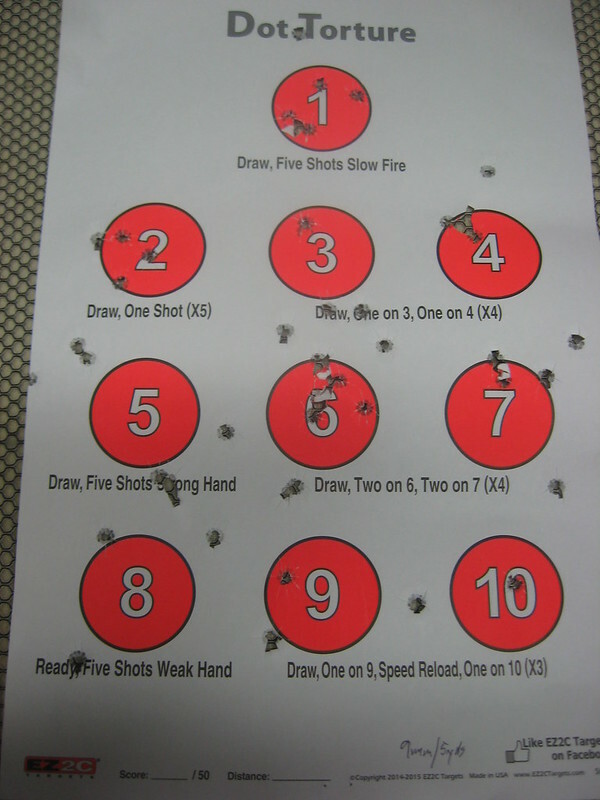 Results were not good, especially in single-handed firing, where I failed to put one round in the circle. Thinking back on it afterwards, seemed like I was flinching/anticipating recoil, which is unusual for me. Perhaps it was because someone was doing rapid-fire with a magnum on one side of me, and someone else was teaching two ladies to shoot on the other side of me, with lots of activity at the bench. Or perhaps I just had too much coffee, or I am just not very good! Think I will move this back in to 3 yards next time out, and see if I can repeat my previous best of nearly clearing all the stations on the drill. Next, turned to the Rangemaster bullseye walk in (5-10 shots at various speeds and distances, starting at 25 yards and moving in to 15, 10, 7 and 5 yards). I had shot this drill only once before, in the first live fire entry in this journal back in April. Saw some improvement here, all shots were in the scoring circle except for one, which just nicked the edge of the paper at 25 yards. Total score was 238 out of possible 300. The 25 yard shots were nothing to write home about, but I got a couple inside the 9 ring from 15 yards, so that was encouraging, and something to build on. 5X5 drill was next (5 strings of 5 shots at 5 yards). Initial benchmark in April was done at 1 shot/second, but since I have been working this drill regularly for speed, I shot it as fast as I could go (don't have a shot timer, but I had the facing timer on 4-second par, shot a little faster than "1-and-2-and-3,", so probably about 3 shots/second). 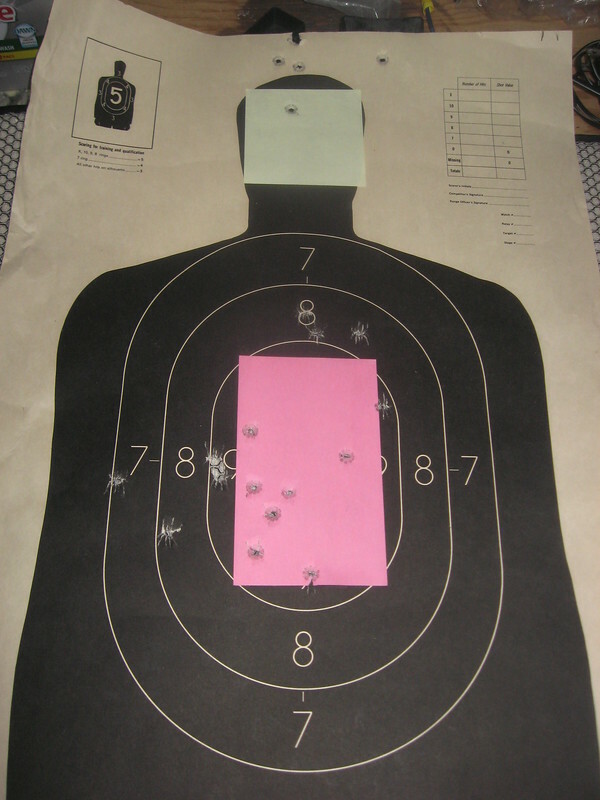 Put 20 out of 25 inside the circles, so 80%, which is OK, but groupings were horrible. Last drill was a Mozambique walk-out (starting at 5 yards, then moving to 7, 10, and 15, two three-shot strings at each distance). Did WAY worse on this drill than during my initial benchmark session, hitting only 11 out of 24 shots (10 head/1 body) on the 3X5 and 2X2 sticky-notes. 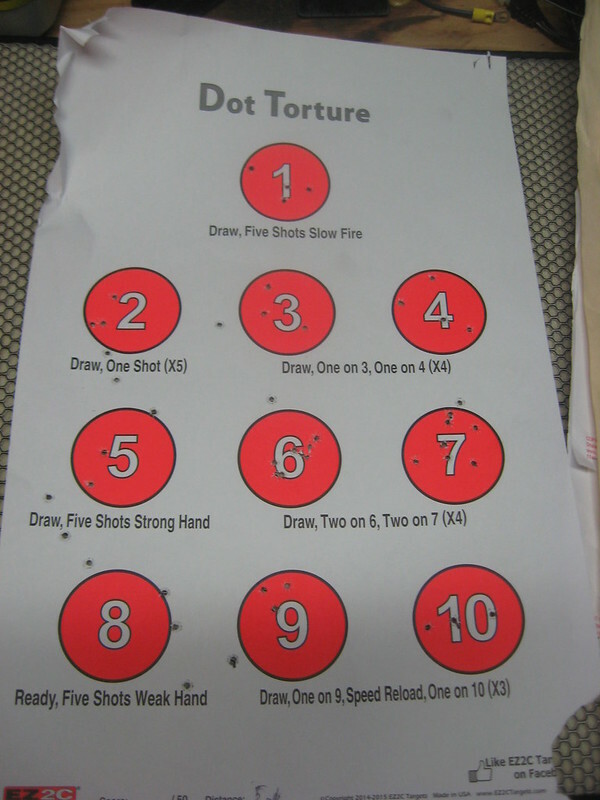 Awarding one point for each shot in the circles on Dot Torture (25 out of 50), plus my bullseye score (238 out of 300), plus two points for each 5X5 shot inside the circles (40 out of 50), plus 3 points for each successful body shot and 6 for head shots in Mozambique drill (36 points total), equals 319 out of possible 496 points, or 64%. D+, or little improvement over the last month. Discouraging, but good incentive to bear down and work harder. Finished off with some .22 work on the Kadet kit. Shot another dot torture (Lord knows I need the practice!) at 5 yards. Did slightly better, putting 29 out of 50 on-target. All shots from "draw" were low ready and DA, and all single-hand shots were in DA. Whiffed with my support hand, but at least I got a couple of strong hand-only shots on #5. Finished with an Around-the-Clock drill (from low ready, 7 yards, 8 sec facing time) to work some target transitions, and did fairly well, especially on the target on the lower left that has consistently give me problems. Shot it six times, but had a couple of light strikes, so if you are counting holes, numbers don't quite add up. 1) Recoil anticipation/flinching was unusual for me. Do other shooters have days where they flinch, when they don't normally flinch? I'll give it another session before I decide whether this is a real problem needing correction, or just a one-off. 2) A lot of my misses were high, today, and in the last few sessions. Possibly due to flinching, or perhaps jerking the trigger. Need to diagnose, analyze, and focus on this in dry-fire and live-fire training. Need to shore up my basic marksmanship before doing any more work on getting faster. 1) Have a few new drills to try, intent is to focus on shooting lots and lots of DA from low-ready/press-out, as suggested by others in this thread. 2) Going to a CCW/CHP class on Saturday. 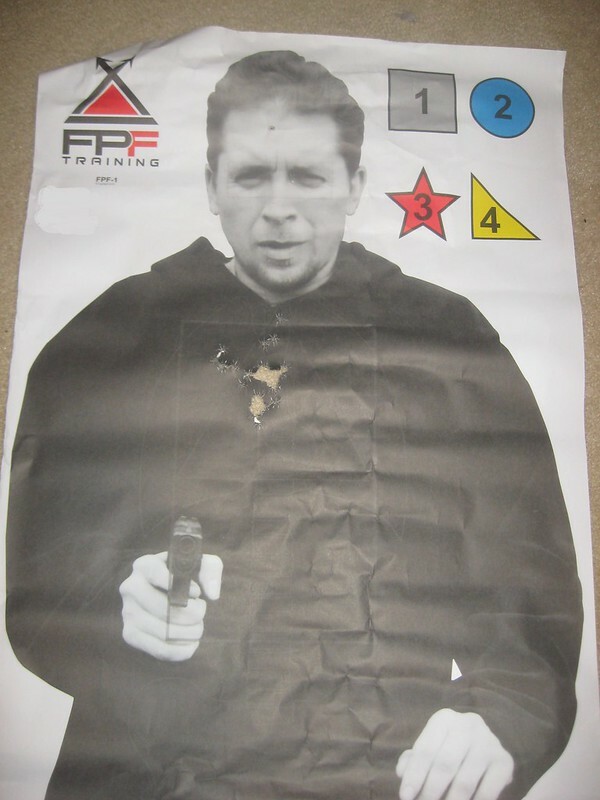 The instructor and class (John Murphy of FPF Training in Culpepper, VA) get really good AARs on-line and is highly recommended by the pistoleros over at pistol-training.com, so really looking forward to it. Hope I get some good feedback and constructive criticism from the instructor on my technique. I have intentionally put off doing much drawing from a holster in my dry-fire practice, because I did not want to instill bad habits, but plan to really start working on drawing from a holster after this class. I don't think that you should feel disappointed. First cardinal rule - focus on the positive and don't dwell on the negative. Note the improvements over the last month and build on them. Most drills you are doing are precision drills - Dot Torture, Rangemaster Bullseye Walk, Mozambique. This means that you MUST focus on accuracy above all else when executing these drills. If your benchmark is almost cleaning the Dot Torture target at 3 yards, do not change the distance and/or the speed until can clean it on demand. Only then, either move it farther, or go faster, but not both at the same time. Use the same approach with your other drills. Master each level of difficulty before you make it harder. If you move to a more challenging exercise before you have completely mastered the easier one, you will not get good results faster, since you will not have developed the solid fundamentals to rely upon. 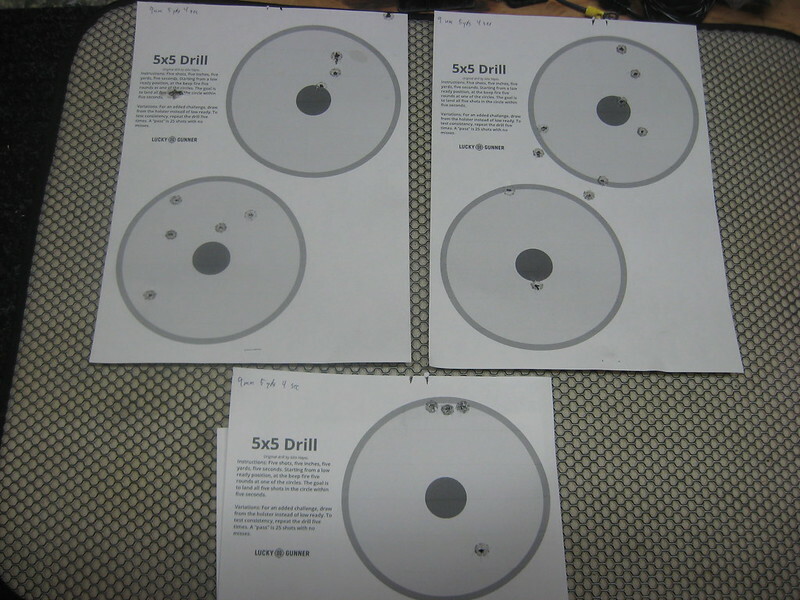 You can also practice you speed drills (5x5x5) in the same session but with a clearly articulated different goal: those drills are not for precision shooting and, using the 5x5x5 as an example, if you can put 5 shots into a 5 inch circle at 5 yards in 5 seconds - ON DEMAND - then it's time to increase the speed or the distance, but not the time to worry about your group size, since it is irrelevant to achieving the goals this drill was designed for. Think of shooting just as any other sport: you master the techniques one at a time until they are automatic, while in parallel working on increasing your overall fitness level, but you do not try to learn them all simultaneously. Keep at it - very good progress overall. Thanks for the advice and encouragement. There is a fine line between objective self-analysis and being overly self-critical, and it is not helpful to cross over that line, so I truly appreciate another's perspective. OlegG is spot on. Steve Anderson really does a good job talking about good self image. He interviews the master himself, Lanny Bassham, and really gets it. My flinching went away after reading Brian Enos' book and then trying to see my sights in recoil with drills and focus and awareness. It really helps shift your focus so it isn't a concern. Great work, keep it up! "In God I trust. All others must supply data." - 20 fast press-out and fire (DA) from low ready, two shots, with target transitions, targets were two 2X2 sticky notes, one placed at about 7 o'clock, and one and at 1 o'clock, worked this down to 3.1 seconds from 3.25 second PAR. Nice training session. Grip felt really good and strong, and it seemed like I was getting a good sight picture, even on the timed press-outs, where I was really working on speed. Thanks SP! Do you happen to know where I could pick up a used copy of the Steve Anderson book? Based on your recommendation, I've had it in my "cart" in Amazon a few times, but it's $30 + S/H, which is a bit steep, so I haven't "pulled the trigger" (is it too early in the morning for bad puns?) . Looked around on the 'net, but haven't been able to find it cheaper anywhere else. I did the same thing too... You could try posting a wtb thread on here and see if someone would part with theirs. So far I have only found it on Amazon and his site. What other books or resources have you used for your primary guides so far? Haha my boss is on the verge of retiring and he drops puns, farmer jokes, and grandpa jokes all the time. We know it's been a rough morning for him when he starts before 3pm. - 20 fast press-out and fire (DA) from low ready, two shots, with target transitions, worked this down to 3.0 seconds. It's great to see you press-out transition drills time going steadily down: 3.0 secs from 3.25 secs in a week is a fantastic progress. Keep it up! On Saturday, I completed the CCW/CHP "Concealed Carry: Foundations" course run by John Murphy/FPF Training in Culpepper, Virginia. An AAR of the course is provided in a separate thread (http://www.czfirearms.us/index.php?topic=80316.0), but I wanted to post some thoughts relevant to my ongoing training here. - Earlier in this thread, there were some posts about the merits of the "elevator" vs. "escalator" draw. Mr. Murphy was definitely a proponent of the "elevator" approach, since he believes that in a self-defense situation, this allows you to get the muzzle pointed at the bad guy faster than "escalator," and if necessary, allows you to get off a shot from retention. - Glad I waited for some professional instruction before I started drilling draws from the holster too much on my own, as the instructors did notice a couple of minor technique mistakes I was making: 1) going too fast on the press out -- need to go fast on steps 1&2, then "smooth and slow" on the press out and fire (steps 3 & 4) so the sights are not bouncing around at full extension; 2) in the four-step draw stroke, I had a tendency to point the gun up at slight angle when going from step 2 to step 3, rather than keeping it pointed straight at the target (apparently a technique mistake that is common to tall guys). So, I've got a few small things to work on, and will now start incorporating draws from holster a lot more into my dry-fire. - Trigger reset: we did a little dry-firing drill on trigger reset during the course. I can see now why this is so important to really shooting fast, and will add it to the list of things to work on. - Concealment garment: I just used an old long-sleeve, button-down shirt for this this course, which didn't really conceal my full-size SP01, but was sufficient to let me practice drawing from concealment. Aside from "shoot me first" vests, what do people typically use in IDPA competitions and for practice? I'm a pretty lean guy and don't have a lot of bulky clothing, so I'm thinking maybe a light jacket/windbreaker? - All of the shooting was done at 3, 5, or 7 yards, so all of my dry-fire and live-fire work over the last six weeks really paid off in terms of confidence and performance. 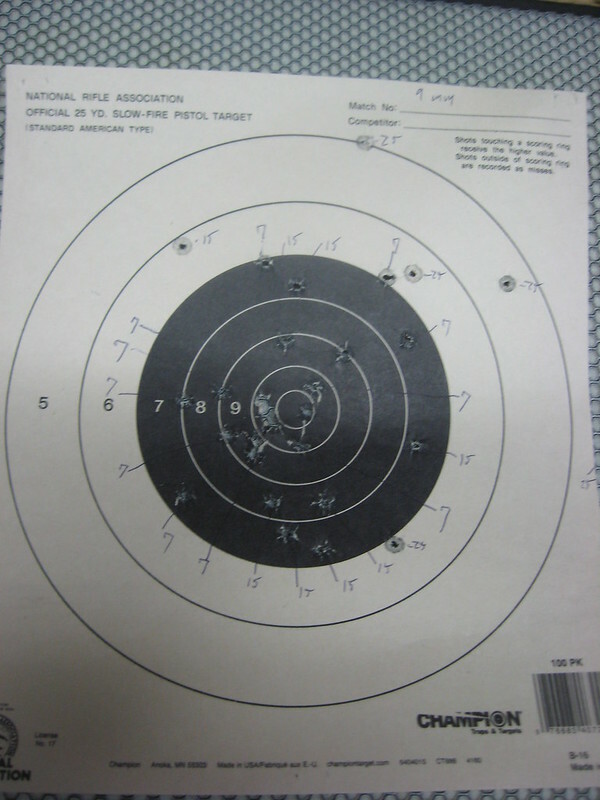 There were 16 students in the class, running the gamut from novice to experienced, and based on what I saw from everyone's groupings, I was one of the most accurate shooters in the class. So, a nice ego boost after being overly self-critical in my last couple of range outings! My qualifer target is included below. The qualifier consisted of 30 rounds shot at 3 yards, including a failure-to-stop string with one shot to the orbital area -- my grouping was essentially a single ragged hole over the heart that could be covered by a tennis ball, plus one shot in the target's eye (doesn't show up well in this photo). After the qualifier was reviewed and photographed, we were allowed to shoot a "happy-happy-joy-joy" string of whatever we wanted from 5 yards onto the same target (essentially a mag dump), so I did 5 rapid fire shots to the body and one to the head (went a little high and put the head shot in the target's forehead just above the eyes).